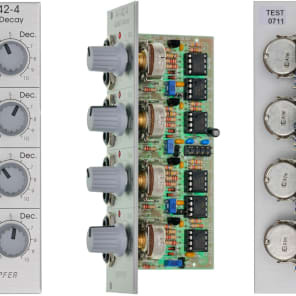 Module A-142-4 contains four simple envelope generators. The only time parameter is Decay and can be adjusted manually by means of the Dec. control in the range 2 ms ... 2 seconds. 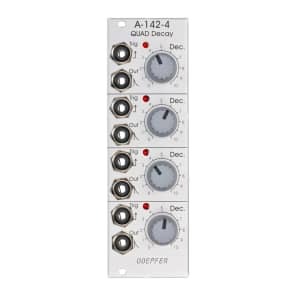 The attack time can be adjusted internally by means of a separate trimming potentiometer for each sub-unit in the range 1 ms ... 15 ms. The factory setting is about 3 ms. This is the attack time of the TB303. Each envelope output has a LED control available. The trigger inputs are normalled (1 -> 2 -> 3 -> 4).